I seem to have blogger's block, but I will do my best. My family owns a campground and has since I was 2. My mother grew up here and then tried to move 1 town away but came back to run the show and then we grew up here. 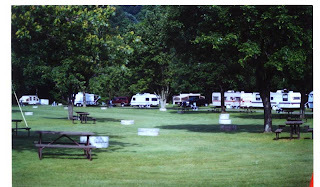 Keep in mind, I like to call it a campground because that portrays a better picture than a trailer park, which is what my mother calls it. 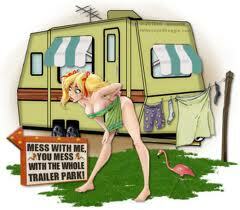 This is what I see when you say TRAILER PARK. 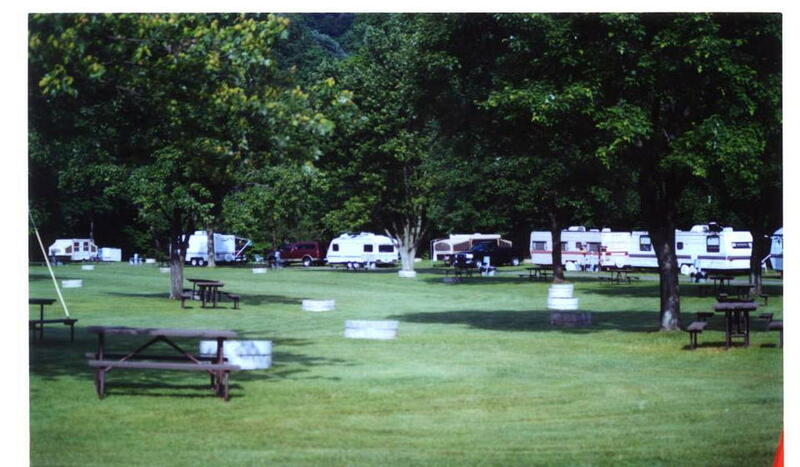 This is what I see when you say CAMPGROUND. but she still wasn't feeling good about it. I found out when I walked down to see it. It had been stripped. All of the lights that should have been on the outside were missing. The metal thing that covers a hot water heater on the outside was missing and they didn't even have one. The license plate was held on with zip ties. They weren't hooked up to the water because they had no pipes inside. The electrical work was missing so they had run an orange extension cord inside. Oh boy. And they smoked like chimneys. And they had 2 dogs who didn't bark much. And they drove a beat up truck that was just as bad as the trailer and they told my mother it didn't reverse. And then I noticed the "curtains". In most trailers, you have either crank out windows or, in most new models, windows that slide open on a track. These people had some crank out windows. And then they had some pop out windows. This meant that they broke the seal on the bottom of a window that wasn't meant to open and they propped the glass out by putting a piece of 2 by 4 to keep it propped open. And then their "curtains" were pieces of plywood that they had set against the windows so that only about the top 6 inches were clear glass. You can imagine that this wasn't going to last long here in a so my mother spent every day wishing they would go away. And then her wish came true. They took the truck and the dogs and NOTHING ELSE and called her from another state and said they were sorry to run out but they had been working for some very rude/mean people who gave them that trailer and then tried to make them remodel it while living in it. She gave the number of the woman who they worked for and said that maybe they would come take it back. And then I went down to see what they had left behind. For starters, the trailer, all windows cranked/propped open as wide as could be. A huge load of lumber that was going to be used to remodel the thing. Clothes on a clothesline. Food. Like they were in the middle of a meal and one said let's go and the other said OK and they just took off. The trash they had ripped out of the trailer to remodel it. And my mother stood there doing the I Told You So dance until she turned blue. Amazingly, when the employers were called to come retrieve this trailer, they did. But they left the crap. Until today. I went over to put it all in the truck to haul it to the dump (so it wouldn't look like we lived in a and it was all gone. Now if only I had taken some pictures so we could all have such fashionable curtains. And I could sell them on my etsy. UPDATE: visit this link to see pictures of the actual trailer and the bizarre circumstances under which I "ran" into it! Nothing is better than stories like this. And where is the camera when you need it??? I am all for protecting people's privacy, but you shoulda taken some pics :-) Too funny! Oh my goodness this was good. Reminded me of a redneck picture book, where some of the words are replaced with pictures. I think we had some "My Little Pony" books like that.